Friday night. I like to get pizza on Friday nights. Don’t ask me why. Even when we weren’t doing this everyday, I like to go out for pizza once a week. Before we had Benji, we’d go to what was then Double Dave’s (now Chez Joey’s…but was Doughy Joey’s when Ogre reviewed it here! Phew!) every Monday night. Anyway, we decided on Sal’s in Plano. I’ve had delivered pizza from the one in Dallas when I worked at Children’s downtown so I knew it was pretty good. We were seated right away and the kids immediately noted the paper on the tables hoping they would get some crayons. Sure enough, eagle-eyed Mina saw our waitress grabbing some crayons for them. 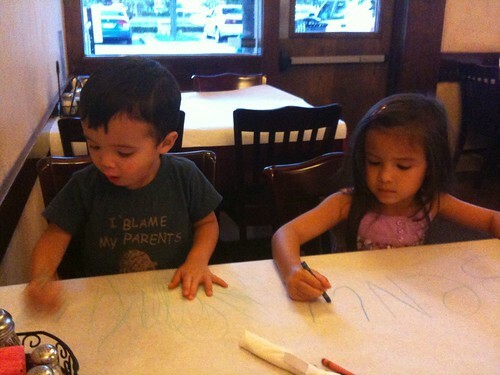 They immediately went to town coloring…eventually scribbling over the entire table. We ordered pizza pasta for the kids. Mina decided she wanted the pink sauce imagining it would be like the pink sauce she loves from Momo’s. She explicitly explained that she wanted it all mixed together (normally she wants in on the side to dip in). We waited for our order and chatted while the kids colored. We had also ordered some garlic cheese bread and munched on that when it came out. As soon as Ogre saw the pasta for the kids, he regretted not having the sauce on the side fearing the messy reprecutions. Oh well. Our pizza came out next and we enjoyed the pizza very much. The kids loved the pasta and actually did not make too big of a mess! Benji came over to get hugs and somehow wormed his way into my lap while I finished up dinner (he refused to sit with Papa). We ordered the garlic cheese bread, which I would not recommend. It was definitely a garlicky bread, but it just had these round slices of provolone melted on top that did not stick very well to the bread. 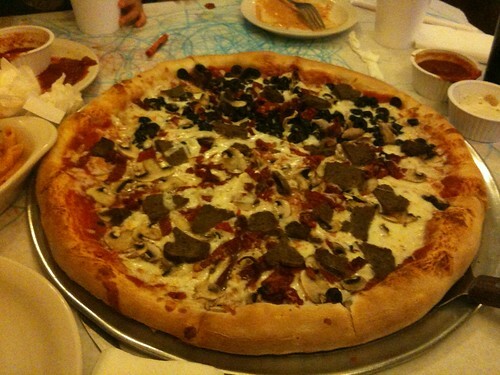 We ordered a pizza with sausage, dun dried tomatoes, mushrooms and half olives. We liked the pizza pretty well. Their crust is hand tossed and nice and doughy but not chewy. Ingredients were definitely plentiful as well. The kids had penne pasta with pink sauce (creamy tomato). If their devouring of the pasta was not evidence enough, Ogre and I both tried it and it was excellent. I’d order this for myself! Okay. Not awesome, but she did her job well enough. Food comes out nice and quick. They let the kids color on the table cloths (well, paper) and they have a good little kids menu. Definitely kid friendly. We liked the pizza here, not the best we’ve had, but it’s up there and the kid friendliness was a bonus! and promoting a culture of cooperation that transcends department boundaries. they rarely find time to rinse their hair. the authority to offer LVTS fund transfers, the said member bank can still offer LVTS services to their clients. many more if you go for buying a business which is running currently. sheet. The online offering will cost you $99 to setup up with monthly fees. list of your business requirements before you search for a CPA. American College of Forensic Examiners International (ACFEI) are entitled to designation as Certified Forensic Accountant. If you take a look at his website you’re going to find testimonials from individuals who have used his cure with amazing results. are yyou on the leaderboard. de la fotografía de bodas. beauty marriage ceremony games for all ladies to get pleasure from! nuevas soluciones al panorama fotográfico. la reducción del bloatware a su mínima potencia, sino más bien asimismo, por lo general, una más veloz actualización de su software. fittings rather than the tubes itself. Many thanks for this post, I’m a huge fan of this site would want to be updated. I just want to tell you that I am just all new to blogging and definitely loved you’re website. Very likely I’m planning to bookmark your blog post . You actually have perfect posts. Thank you for sharing your website. write. The arena hopes for more passionate writers such as you who are not afraid to mention how they believe.